Historian Eduardo Contreras will discuss the centrality of unions and labor organizing in Latino life from the 1930s to the 1950s. 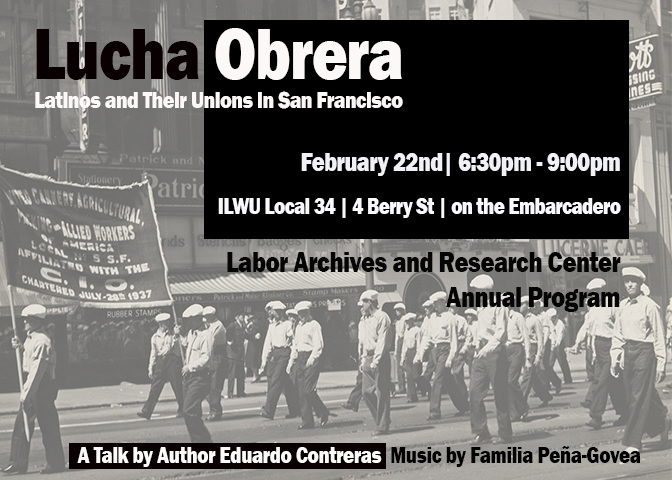 Drawing on material from his new book, “Latinos and the Liberal City: Politics and Protest in San Francisco”, Contreras will explain how unionization transformed Latinos into political actors and how the pursuit of rights, power, and recognition emanated — first and foremost — from their unions. This entry was posted on Friday, February 8th, 2019 at 4:56 pm	and is filed under Event. You can follow any responses to this entry through the RSS 2.0 feed. Both comments and pings are currently closed.